"We have thrown away our honor. We have joined the side of gangsters." Unlike Finland and Romania, Hungary was not part of the official planning for Operation Barbarossa, the treacherous Axis attack on the Soviet Union. Two months earlier, German planners had counted on full Hungarian participation in the attack on Yugoslavia, a plan thrown into disarray at the last moment by the suicide of Prime Minister Pál Teleki upon learning of his nation’s planned betrayal of its “Treaty of Eternal Friendship” with Belgrade. Hungary did eventually send a small corps into the Soviet Union, and this unit is present in our Defiant Russia game. 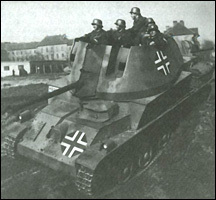 Hungary received German requests to reinforce her border defenses in early June 1941, but not until a week before the 22 June attack did the Germans let the Hungarians in on their reasons. When the attack began, Adolf Hitler demanded that Hungary declare war on the Soviet Union; Hungarian Regent Nicholas Horthy refused to even sever diplomatic relations, citing the clauses in the Axis treaty that spelled out the defensive nature of the alliance. 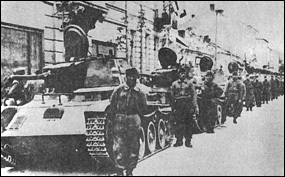 Toldi 1 tanks of the Hungarian Mobile Corps, 1941. On the next day the chief of the Hungarian General Staff, Gen. Henrik Werth, urged the Cabinet to declare war. As a compromise, the government finally recalled its ambassador from Moscow. And there things might have remained, but on the 26th unidentified aircraft bombed two Hungarian cities and strafed a train. Just where these aircraft came from, or who piloted them, remains unclear almost 65 years later. But the Hungarian public blamed the Soviets, and on the 27th Hungary declared war on the Soviet Union. The grandly-named “Carpathian Army Group” was ordered to commence a general offensive through the Carpathian Mountains and into the Soviet-occupied zone of southern Poland. But operations were hampered by the fact that, despite a long military tradition, the Royal Hungarian Army (Kiralyi Honvédség) was simply not very good. Mobilization came slowly, training was deficient, and the troops poorly armed. Thus the “army group” began its offensive with just two brigades: 1st Mountain and 8th Border Guard. Within a few days they were joined by the “Mobile Corps” of one cavalry and two motorized brigades. Over the next four days, while German panzer spearheads raced forward over huge stretches of ground, the Hungarians advanced only 10 kilometers. On 9 July the Carpathian Army Group was broken up, with the mountain and border guard brigades re-assigned to wipe out Soviet units still resisting in the rear areas and the Mobile Corps of three brigades assigned to the German 17th Army. All three brigades contained a mixture of motorized, horsed and bicycle battalions; a mixture that was thought to allow mobility in any sort of terrain but in practice limited the unit to the pace of its slowest component (usually the cyclists). A Hungarian “Nimrod” anti-aircraft tank. Yes, that’s its real name. Throughout July the corps saw much more action, and at the end of the month recorded a signal success, participating in the encirclement at Uman. The Hungarians fought well over the next few weeks, and were assigned an important mission, capture of the Black Sea port of Nikolayev (most likely to help balance the Romanian responsibility for taking Odessa). A four-day battle resulted in the city’s fall, though most of the defenders escaped to fight another day and the shipyard workers had plenty of time to destroy the warships on the slipways there. Though much was made of the capture, the Hungarians had been placed under a German corps command and did not plan the operation. The fall of Nikolayev led to a confrontation within the Hungarian leadership over their future role in the war. Werth and some of his generals pressed for full commitment, with more divisions dispatched to the east to join the German war effort. Prime Minister László Bárdossy and most of the civilians believed the war was almost over, that Hungary had done enough and it was time tio take advantage of German success to withdraw her forces. After some wrangling Horthy came down on the side of the civilians and fired Werth. In September the cavalry brigade was returned to Hungary, as it had lost most of its horses and was no longer considered combat-capable. Its motorized and bicycle components remained at the front to bolster the greatly-reduced motorized brigades, which had lost up to 80 percent of their vehicles. Horthy agreed to a German request to send four infantry brigades for occupation duties; when they took their posts the motorized, mountain and border guard units would all return home. Before this could take place, the Soviets launched a counter-offensive at Izyum and the Germans rushed the Hungarian brigades into the breach. They fought well there, but a grinding form of trench warfare developed in freezing temperatures by the end of the month and the corps commander, Béla Miklós, flew to Budapest to urge Horthy to order the troops home. On November 10th the corps formally departed from the Soviet Union. 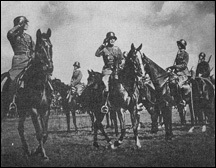 Hungarian hussars in Ukraine, summer 1941. In Defiant Russia, for simplicity’s sake there are no special rules concerning the Hungarian corps’ deployment: The game ends with the December turn anyway. But Daily Content is all about special rules; use this or not as you see fit. During each Axis Organization Phase starting with the September turn, the Axis player rolls one die. On a result of 1, the Hungarian unit is immediately removed from play, but does not count toward the casualty total for victory purposes. Subtract one from the die roll on each subsequent turn (so that the Hungarians are removed on a roll of 1 or 2 in October, 1 through 3 in November and 1 through 4 in December). 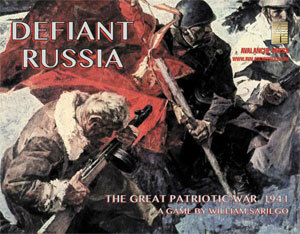 Click here to order Defiant Russia right now! Yes, now.